On behalf of Kappa Xi Omega Sorority, Incorporated, I would like to welcome you to our national website. Here you will find a host of information regarding our immaculate sisterhood. 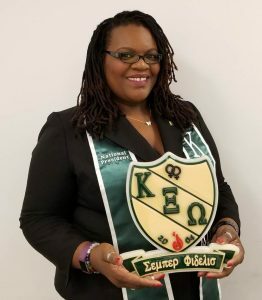 Kappa Xi Omega Sorority, Incorporated is a community-based community-service oriented Greek letter organization that was specifically created for professional lesbian women in 2004. Since our founding, we have expanded across the United States and have members from every walk of life. Our focus for the 2018-2020 sorority term is on STRIVING TOWARDS OUR CORE VALUES. We aim to emulate our core principles as we maintain a strong sisterhood while giving back to the communities in which we reside. We remain focused on being the embodiment of empathy, fidelity, integrity, patience, understanding, and unity while creating members with strong leadership skills and abilities. Please take a moment to get to know Kappa Xi Omega and her members by visiting the various links across the top of your screen. We welcome you to our community service and educational events where you will have the opportunity to see our sisterhood and our passion for service in action. As the 2018-2020 National President, I am excited about the privilege to serve alongside my sorors as we engage in our signature programs, elevate one another, and serve the LGBTQA community selflessly. Kappa Xi Omega Sorority, Inc.